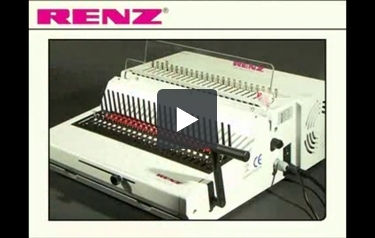 The Renz Combi E Electric Comb Binding Machine includes a heavy duty foot pedal controlled electric punch capable of punching up to 25 sheets of 14" paper. The Renz Combi E is capable of punching up to 25 sheets of 14" paper per lift and includes fully disengageable dies, an adjustable depth of punch control and a heavy duty manual comb opener. The Renz Combi E is a professional model for publications from small formats up to 14" or A4 (34 cm) binding width. A very efficient model with electrical punching and a single binding lever. Punches easily by pressing the foot pedal. The powerful drive system has a very fast cycle speed for high output. Punches up to .1" (2.5 mm) thickness. The binding capacity is up to 300 books per hour. Adjustable margin control and selectable punch pins for easy format adjustment. The Combi E is the electrical model for punching and plastic comb binding, the most cost effective binding method available. The Combi E comes with additional features, offering the user a greater degree of control. Simply measure your document to determine the comb needed. Select the corresponding size on the attachment screw to set the opening hooks and choose A4 or A5. You also have the additional option of adjusting the margin with the depth gauge and selecting from a set of punch pins to be disengaged individually. Hold the comb with the arrows pointing up and place the comb on the comb holder. Pull the smaller lever towards you as far as it will go to open the comb. Punching your document is then made quick and easy with just one tap of the foot pedal and a fast punching cycle, allowing you to build up to 300 books an hour. Once you've punched your document, you can then load it onto the comb in the finished order. Push the smaller lever all the way back to close and release the comb and your document is now bound and finished. Comfortable and economical binding with the Combi E from Renz. A good electric comb binding machine can really help you finish off those important documents in very little time. One particularly good one is the Renz Combi E. Here's all you need to know about this product. Check it out. Punching capacity: The Combi E has an excellent punching capacity. It has the amazing ability to punch 25 sheets of 20 lb. bond paper at one time. Over the course of an hour, it's possible to process up to 10,000 sheets which is one of the highest amounts of any comb binding machine. Punching length and margin control: You will be able to punch different sizes of paper with this machine because it has disengageable dies. Your documents can be up to 13.5 inches long, enabling you to work with letter- and legal-sized paper. No matter what size paper you choose, you can decide where exactly it will be punched thanks to the adjustable depth of punch margin control. This feature allows you to control the depth of the margin so your books will be strongly bound no matter how thick they are. Binding capacity: One of the great things about comb binding is that you can use it to bind lengthy documents that contain as many as 500 pages. The Combi E can certainly help you do this because it accepts all sizes of combs, including the 2-inch ones designed for thick books. This way, your documents can be any length you want. Also, this device will bind your books quickly no matter what their length. In fact, it can bind up to 300 documents per hour. Machine design: The Combi E will take up a fair amount of room because its dimensions are 19.3" (length) x 19.7" (width) x 9.9" (height). It's also a bit heavy, weighing in at just under 80 pounds, so transporting it could be an awkward experience. Also, the device's comb opening/closing handle could be a bit difficult for left-handed people to use seeing as it's located on the right side of the unit. Operation: This is an electric machine that comes with a foot pedal which operates the punching mechanism. Using a foot pedal for punching greatly speeds up the process while allowing your hands to remain free for binding. All together, this makes creating books with the Combi E fast and easy. Special features: The Combi E can punch items that are up to 0.1" thick, so you'll be able to use heavier stocks and even plastic covers. Finally, the machine comes with a one-year warranty. There are so many good things about the Renz Combi E, from its speed and binding capacity to its disengageable dies and ability to punch thicker items. It would be an excellent choice if you need a comb binding machine that can give you great results in almost no time at all. While the position of the handle will be awkward for some users, this is really a machine worth looking at.